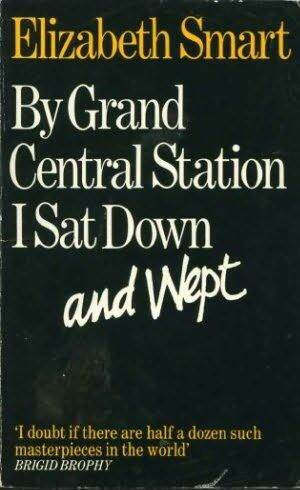 If there has ever been a book which has split me in two, and sent me spinning haphazardly in those opposing poles, it is most certainly Smart’s By Grand Central Station I Sat Down and Wept (1945) which I will refer to as BGCS, for no reader will forgive me for filling up this column with the lengthy title. Smart (1913-1986) was a Canadian poet and novelist who had an infamous affair with the writer George Barker, whom she had four children with. This novel or poetic prose if you will, is a testament of that fiery relationship. The text is written mostly in anapestic meter which carries the reader along whether they like it or not and it feels as though we’ve has lost all control as the break peddle has been disengaged. It is always quite evident when a writer is a poet by nature first and a novelist second, which is especially apparent with Smart as we wade through thick pits of slippery synonyms. Layers of meaning pile upon one other as each word is designed to have full impact, not simply within the text, but upon its reader, and it is not surprising if you find yourself twitching your neck and straightening your shoulders as you attempt to bear the weight of her words. Smart’s lament for her love; a married man who has chosen to stay with his wife, is bursting with images of tortured hearts and souls and it is only after the first 41 pages (out of 112) that I was able to fully engage with this text. Once Smart slowed down on calling upon the fates and mythological entities, one can finally see the true essence of this novella-esque piece which gained a great cult following in 1966 when it was reissued. In Smart’s world, love is wounding and a violation which strips you bare and in turn Smart’s typewriter becomes an open diary for the world to see. At first, it seems as though she is terrified of ‘spilling out’ or being read, but it seems to be the only thing she can do. There are a number of moments, which even Rilke (whom she quotes) might have blushed at as she cries out for bravery; (pg34) “Oh canary, sing out in the thunderstorm, prove your yellow pride. Give me a reason for courage or a way to be brave.” A very modern woman might feel the need to become violent and shake Smart, but as her reader, and now confidant, we can not help but feel pity and pain all at once. Her electrical surging laments are of being absolutely and intolerably consumed by love, and blinded to anything or anyone outside of it. This is not only unhealthy, but it is also tedious, especially when she communicates in such a way (pg39) “I am possessed by love and have no options”. She is neither solid nor sturdy, particularly in the company of her all-encompassing lover and therefore becomes almost pathetically feeble. Although it takes 41 pages of this lamenting tragedy to take on a more palpable essence, it does become worth hanging on in there, this of course depends on your ability to stand strong against the current of self-pity and doubt. The poetry, although unrelenting at times, is in fact quite rich.